Out with the old! In with the new! Modern architecture is architecture that emerged in the 1920s in Europe and the United States. It began as a response by architects to rapid technological advances and greater urbanization of society at the turn of the century. Modern architecture is known for its use of new materials and new construction technologies. Modern architecture is architecture of simple forms (rectangles) enclosed with flat opaque (solid) or transparent (glass) walls. The new materials - glass and steel changed the look of buildings, the experience of being inside looking out, and construction time and technique. 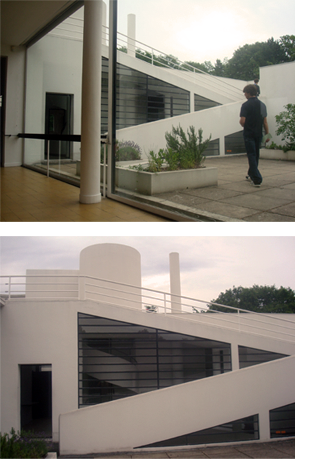 Watch Iconic Houses to see elements of balance, composition and inside outside relationships. Steel and glass engineering produced skyscrapers - a new building type that transformed skylines around the world and pushed living in the sky to new heights! 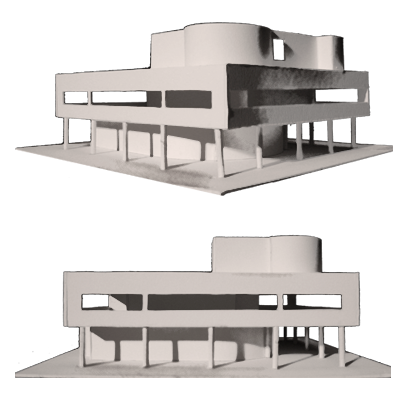 Modern architecture is considered progressive (forward looking) rather than regressive (backwards looking or stylistic). The assembly of standard components and new technologies of travel - particularly cars, ships and aircraft - inspired imagery of an optimistic, heroic and progressive era. Modern architecture expresses volume (rather than mass), balance (instead of symmetry) and elimination of ornament (or applied decoration). Take a look around your city. Do you see tall buildings that have flat roofs and flat facades? Find three buildings that look ‘modern’. Research when the buildings were built and what they are used for. Draw a perspective sketch of each building showing how the buildings fit into the skyline. (Google Earth 3D may be a useful reference). Then draw details that express the construction. Reveal modern materials and joints. Research houses built between the 1920’s and 1950’s by one of the modern architects listed. Find images of plans, sections and elevations. 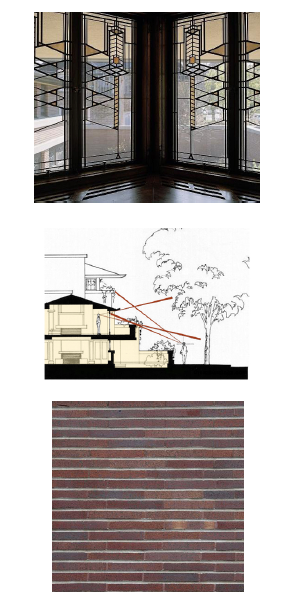 Copy the drawings and look at the flatness of the walls and the flow of internal space. Study the elevations and analyze the relationship between the solid parts of the walls, the structure and the large glass areas. Make a diagram of ‘space flow’ that records interior volumes. Watching the modern house videos will help you understand how to see space flow into and through the rooms. Ludwig Mies van der Rohe (1886-1969) was a leader of the Bauhaus School in Germany. He organized an exhibition for a new housing idea called the International Pavilion that offers a continuous flow of space framed by horizontal planes ordered by geometry of structure. 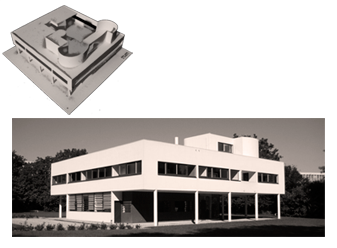 In 1938, Mies van der Rohe started a twenty year period as head of the Illinois Institute of Technology in Chicago, Illinois. During his leadership he designed the master plan for the campus and several buildings. Mies designed rectangular boxes of brick, glass and steel laid out on a 24-foot module. The 24-foot module organized even the landscape. 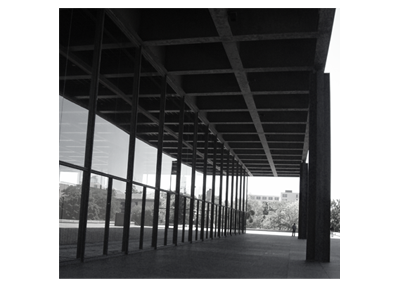 The buildings were straightforward, simple steel, brick and glass boxes reflecting his famous quote, “Less is More.” Research the Barcelona Pavilion and Crown Hall. Choose one of them and draw the plan and elevation. See if you can find the module that Mies used to organize the design! Frank Lloyd Wright spent more than 70 years creating designs that revolutionized the art and architecture of the twentieth century. Many innovations in today’s buildings are products of his imagination. In all, he designed 1141 works - including houses, offices, churches, schools, libraries, bridges, museums and many other building types. Of that total, 532 resulted in completed works, 409 of which still stand. However, Wright’s creative mind was not confined to architecture. He also designed furniture, fabrics, art glass, lamps, dinnerware, silver, linens and graphic arts. In addition, he was a prolific writer, an educator and a philosopher. He authored twenty books and countless articles, lectured throughout the United States and in Europe, and developed a remarkable plan for decentralizing urban America (Broadacre City) that continues to be debated by scholars and writers even to this day - decades after its conception. Wright is considered by most authorities to be the 20th century’s greatest architect. Indeed, the American Institute of Architects in a recent national survey, recognized Frank Lloyd Wright to be “the greatest American architect of all time.” “Architectural Record” magazine (the official magazine of the American Institute of Architects) declared that Wright’s buildings stand out among the most significant architectural works during the last 100 years in the world. Frank Lloyd Wright wrote, “A building is not just a place to be. It is a way to be.” Create a poster about Frank Lloyd Wright’s prolific career! What new materials changed the look of architecture? Modern architects used ornament and decoration in their designs. What international building type came out of modern architecture?